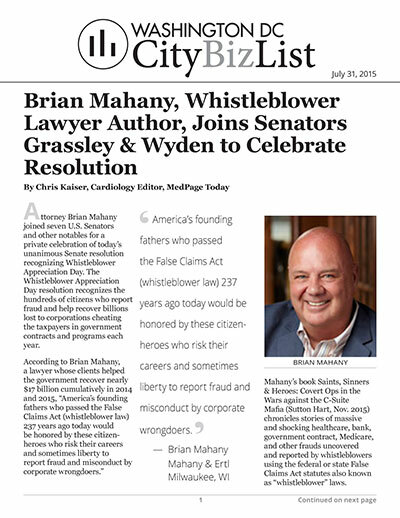 Attorney Brian Mahany joined seven U.S. Senators and other notables for a private celebration of today’s unanimous Senate resolution recognizing Whistleblower Appreciation Day. The Whistleblower Appreciation Day resolution recognizes the hundreds of citizens who report fraud and help recover billions lost to corporations cheating the taxpayers in government contracts and programs each year. Mahany’s book Saints, Sinners & Heroes: Covert Ops in the Wars against the C-Suite Mafia (Sutton Hart, Nov. 2015) chronicles stories of massive and shocking healthcare, bank, government contract, Medicare, and other frauds uncovered and reported by whistleblowers using the federal or state False Claims Act statutes also known as “whistleblower” laws. Senators Chuck Grassley and Ron Wyden, Chairman and Vice Chairman of the Senate Whistleblower Protection Caucus, and Senators Ron Johnson, Tammy Baldwin, Thom Tillis, and Mark Kirk who serve on the Caucus, joined author Mahany in praising the heroes, the U.S. Department of Justice, state Attorneys General, and other agencies that use citizen-provided information to prosecute False Claims Act cases. The U.S. Department of Justice and 37 State Attorneys General are aggressively using the U.S. and State False Claims Acts (whistleblower laws) in healthcare fraud (Medicare, Medicaid…), government contract fraud, financial fraud and other cases where the government has been financially harmed. Multi-hundred million dollar recoveries against U.S. corporations are announced almost monthly. Under state and federal False Claims Acts private citizen whistleblowers are incented to report fraud against the government by a cash bounty of 10 to 30% on what the government collects from corporations involved in the healthcare, government contract, financial, or other fraud. $70 billion+ has been collected to date with whistleblowers receiving hundreds of millions in reward money.